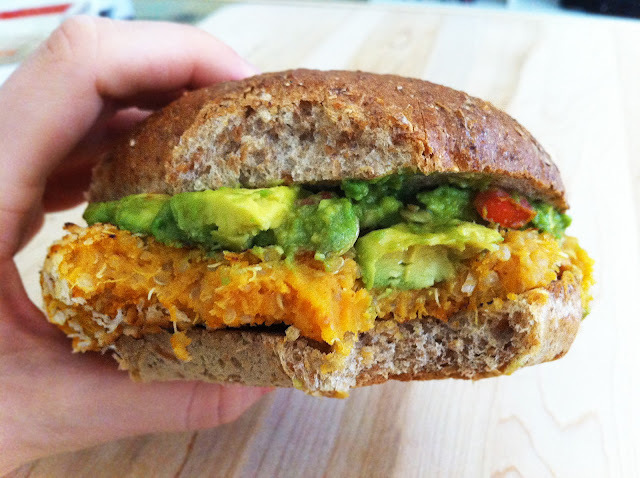 There is nothing quite like these savory, sweet, spicy, and crunchy quinoa sweet potato burgers! They are packed with flavor and amazing nutrients - and not to mention, gorgeous looking! I was so excited to try to come up with a recipe for these, and it has finally arrived. The best aspect of vegan burgers is the level of creativity you can have with them, as well as their potential for incredible nutritional value. There is no guilt after eating one of these babies! Just a meal packed with protein, rich in vitamins and minerals, and mouth-watering-savory-sweet-crunchy bite after bite enjoyment. Nutritional value: Sweet potatoes are packed with high amounts of vitamin A, vitamin C, manganese, as well as contain fiber and are a highly anti-inflamatory food. Out of all the grains, quinoa has the highest amount of protein. Quinoa is also filled with fiber, phosphorous, manganese, iron, and magnesium. Not to mention it is gluten free! Beans and avocado add extra fiber and protein. While avocado also adds vitamin C, vitamin K, folate, and pantothenic acid. Now top it all off with iron, vitamin K, riboflavin, magnesium, phosphorus, folate, zinc, copper, and manganese rich raw pepitas - and whew! - you are loaded with nutrients. This recipe yields either 2 extra large patties, 3 medium sized patties, or 4 sliders. Start by heating a small pot on the stove with the 2/3 cup filtered water and 1/3 cup quinoa. Bring it to a boil, then reduce to a simmer and cover. Let the quinoa cook for 10-15 minutes (or until all the water is absorbed), then remove from the heat and let rest for at least 5 minutes. While the quinoa is cooking, peal and dice 1 medium, or 2 small, sweet potatoes. Cook the sweet potatoes in a pot of boiling water on the stove for about 10 minutes, or until soft and mash-able. This recipe was featured on Healthy Vegan Fridays over at Every Day Vegan Girl! Check it out here. Mmmm I love the crunch panko adds to burgers. Pair that with the sweetness of sweet potato, heat from the chipotle and the creamy mellowness of avocado, well you just can't lose! Thanks for linking up to Healthy Vegan Friday! Have a great weekend! Thank you for including me in your Healthy Vegan Friday! Love what you do - have a wonderful weekend too! Yes I love Kathy's recipe! I first made that one over 6 months ago when I decided to go vegan. 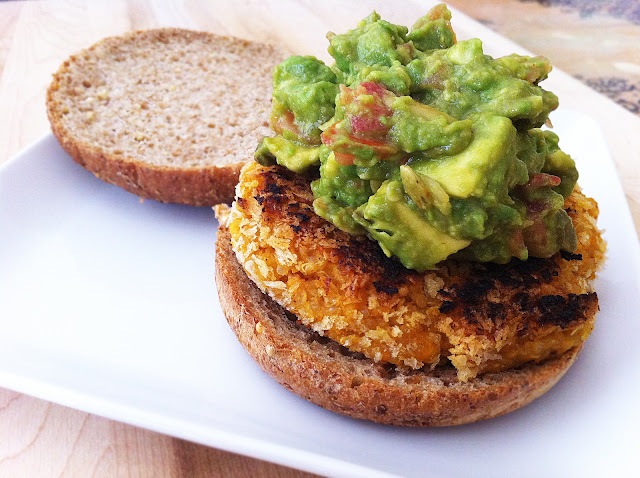 There are so many chipotle sweet potato burger recipes out there - excited adding quinoa turned out so well! Made these last night and they were incredible! Fantastic flavor and the combo of the beans, sweet potatoes and quinoa was hearty and satisfying without feeling like a lead lump in my stomach. If you can definitely add the tahini as that seems to be the key ingredient. AMAZING! In your opinion would you be able to grill these? Do they hold up well by themselves? Hello there! You know, these are pretty soft, so I would say no to grilling. Awesome, thanks for letting me know! I'm excited to try them out! Of course! This is my favorite burger, I hope you like it too! What if he used coconut oil to grease a grill basket and putting the burgers in that? The great thing about this tasty vegan burger is indeed you can have too much of a good thing! I just went vegan from all-on meat-lover last Monday. This is an overwhelming change! Trying to find enough recipes to get a portfolio so my husband doesn't lose heart. In fact, the whole change is for him - heart problems the docs can't fix with any more stents. Since this is a big change from hamburgers, do you think I could make it a main dish by making them hush-puppy sized so it's a stand-alone non-substitute? I'm thinking of adding a veggie scramble of some kind and adding something else. Don't know what yet.